An esoteric disease which reveals things in their true light; three pairs of disembodied feet galavanting about the countryside – Abigail Walthausen explores the brief but strange literary career of Daniel Carter Beard, illustrator for Mark Twain and a founding father of the Boy Scouts of America. 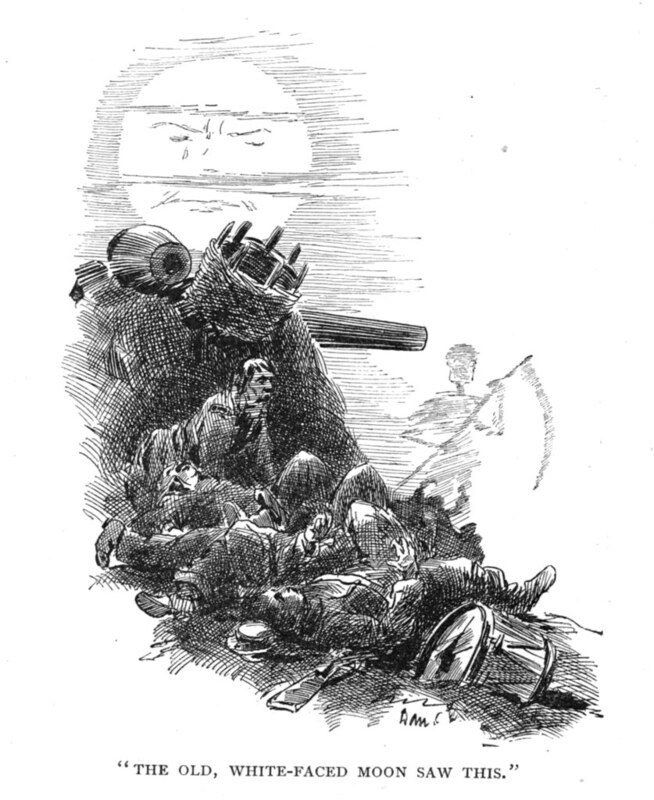 Illustration from Moonblight (1889) – Source. Although Daniel Carter Beard is best known as one of the founders of the Boy Scouts of America, he was also a well-known illustrator and a literary man. The latter is evident in a definite flair for titling apparent at all points in his career, from the alliterative titles of his illustrated woodcrafts manuals (among them Shelters Shacks and Shanties, Bugs Butterflies and Beetles, and Signs, Symbols and Signals) to his ominous autobiographical Hardly a Man is Now Alive. But the most memorable monikers amongst his books come from a pair of novellas that he wrote early in his career and promptly tried to forget: Moonblight and Six Feet of Romance. These novellas, published in 1892, were written during a period in Beard’s life when he was enduring backlash for the illustrations he had done for Mark Twain’s A Connecticut Yankee in King Arthur’s Court. He was blacklisted by magazines and publishers alike not just because of his association with the controversial anti-church, anti-industrialist, anti-imperialist content of Twain’s work, but because in many instances Beard’s illustrations for the novel were more inflammatory than the text itself. 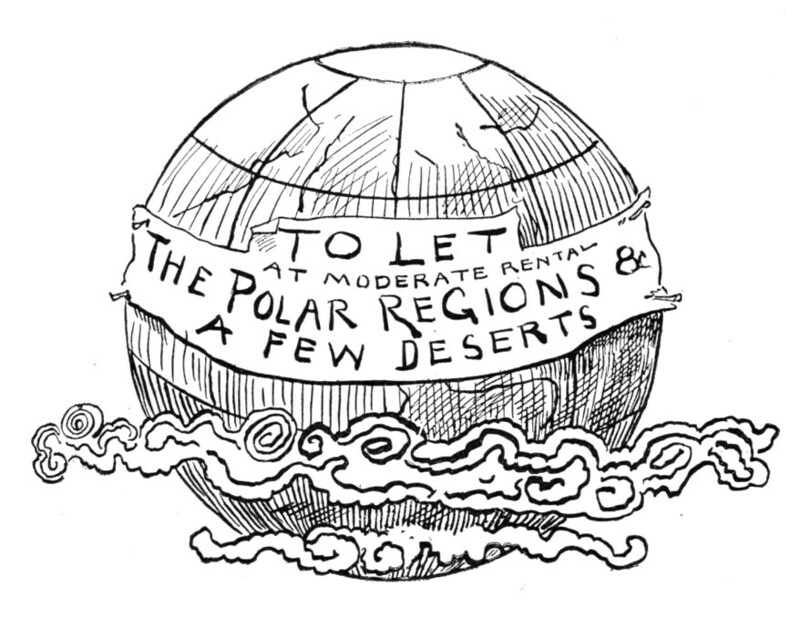 Although Twain was pleased with Beard’s work, saying, “Dan Beard is the only man who can correctly illustrate my writings for he not only illustrates the text, but he also illustrates my thoughts,” the illustrations often diverged from the story’s literal plot and sometimes even from its explicit message. In several of his most notable revisions, Beard inserted the faces of contemporary figures into his work. As a great follower of Henry George’s politics, Beard also worked in a number of illustrations that use Georgist language to promote the “single tax” theory. In both cases, Beard was working to ensure that Twain’s anachronisms would be read as explicit critiques of 19th century society, a mission he would continue in his work on Moonblight and Six Feet of Romance. Beard’s Frontispiece to A Connecticut Yankee in King Arthur’s Court (1889) by Mark Twain – Source. In Moonblight, a labor movement novel, Beard develops the politics that he began in his Yankee illustrations. The story’s nameless protagonist is an owner of a mining company who discovers a medieval manuscript while staying the night at a tavern in the room of a stranger. The book details the condition of “moonblight,” an esoteric disease which allows people to “see things as they really are.” After said fascination has set in, crews of coal miners with blackened faces become antebellum slaves before our protagonist’s eyes. When he attends a meeting of mine-owners he sees that their faces take on the likenesses of a fox, a wolf, and a rattlesnake. A baby is born. It has ears: that means it was intended to hear. It has a mouth to receive nourishment: that means that nourishment is provided for it. It has neither wings nor fins, but feet: that means that it must walk, and is a land animal, and must have land to walk on. All these things will teach you that it has an inherent right to light, air, water, and food; to procure the latter it has hands to transform the products of the earth to a suitable form by labor. I have already said that Nature has provided untold wealth for the babe, yet we will not allow it to use its hands, unless it does so for us. Just as so many of Beard’s pen and ink images are surrounded in curls of smoke, the literary scenes he creates are often hazes and conflations of images — things obscured or transformed by altered states of mind and magic. His illustrations in Yankee and Moonblight alike are closer to Renaissance emblems that they are to narrative illustrations. Although the intent of Beard’s illustrations for Twain was often overtly political and didactic, his illustrations of his own work added the subtlety that his own writing lacked. If Beard’s stories were simplistic, lacking Twain’s type of moral ambiguity, his drawings added a dimension of sensitivity to the issues he handled so awkwardly. My antique frying-pans, toasters, and waffle-irons all have very long handles; the andirons of the same date rear their massive brass heads several feet above their strong wrought-iron cross-bars. How plainly these things tell us of the great log fires that roared in their ample fireplaces in the brave old days of our great grandsires! His attention fixates on a favorite item, an old foot stove, so intently that his surroundings became “misty and indistinct, and finally disappear.” In the suddenly unfamiliar haze of his New York Studio, a hand appears and then a pair of feet in dainty period dress. 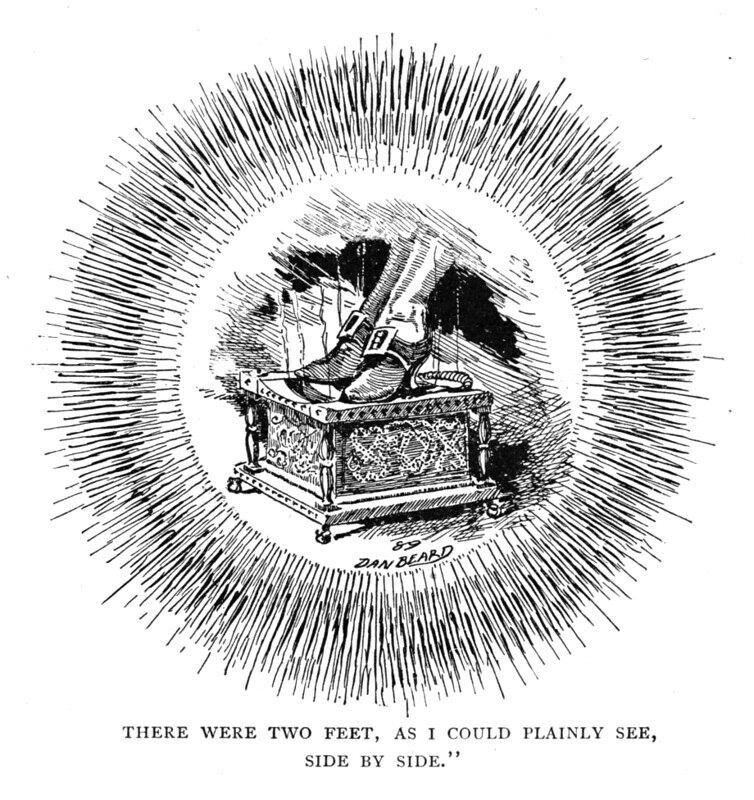 When the mysterious hand reaches into the foot stove and absconds with its coal cup, our narrator is forced out of his comfortable chair and must pursue not just this pair of disembodied feet, but two more pairs representing men of aristocratic and common origins (we can tell from their shoes). All six feet, followed by Beard, mysteriously leave New York and go for a romp in the countryside. Ultimately, the man in the scruffier boots prevails over the aristocrat in a duel and the woman of the dainty red shoes walks off with him, leaving the foot stove behind. When the narrator comes back to reality in his studio, we wonder what the point of this reverie was. Is it that his alter ego, the boots hanging alongside the buckskin pants, was on the right side of history? That the true America is with the rough and tumble Sons of Daniel Boone? There is a shade of that, but more than anything, the piece is a whimsical flight by a highly visual man. Nostalgia, he posits, holds none of the harm that Twain seems to see in it — it is a gorgeous way to daydream. Illustration from Six Feet of Romance (1889) – Source. The achievements that I have discussed so far, illustrating for Twain and founding the Boy Scouts of America, actually only account for the final 30 pages of Beard’s 360 page autobiography, Hardly a Man is Now Alive. The rest of the book demonstrates a strong link between his affection for Twain and his inventions in scouting. The remaining 330 pages are devoted to Beard’s childhood and young adult years with a great emphasis on coincidence and the forces that brought him into (and out of) a great many scrapes and near disasters. Even when describing his adulthood, he tells stories of mischief. While he was working as a surveyor, he says he “took delight in always putting into [his] records mention of real occupancy, genteel or disreputable.” He describes with pride a small menagerie he kept in his Queens backyard that included a Javanese pygmy musk deer. During one stay at a hotel, he alerts the management of the infestation with an “impromptu natural history collection of cimex lectularia” that he makes by stringing the insects on a piece of thread and leaving the garland with his complaint at the front desk. Beard with Boy Scouts, pictured in 1937 when Beard was 87 years old, from Bain News Service – Source. Beyond a doubt, in his youth he was more of a real boy than any other boy between Canada and Belize. If the boy Sam Clemens thought of more things, did more things, got into more scrapes than any other lad, if he were endowed with a greater capacity of mischief, it was because of his more highly developed imagination. With that imagination he developed a broad charity for others. Although it is clear that Beard was interested in youth work throughout his career (much of his earliest work appeared in youth magazines like St. Nicholas), there is one story he tells in multiple books to explain his initial call to scouting. As he is walking through New York on a cold winter’s day, he sees boys at the foot of a statue of Benjamin Franklin. In some versions of this emblematic moment the children are newsboys sleeping there, and in some they are urchins playing dice games. Both stories are of a Hank Morgan or a Huck Finn — the self-sufficient scout and the mischievous rascal. Beard’s intense and extended engagement with Twain was an important step towards developing the tone of Boy Scouts: the relationship nourished his visions for the ideal boy, the connection between man and land, and the place of nostalgia and tradition in American culture. These novellas serve as a bridge between the straightforward pedagogical texts like The Handy Book and the narrative and ceremony of the Boy Scouts of America. 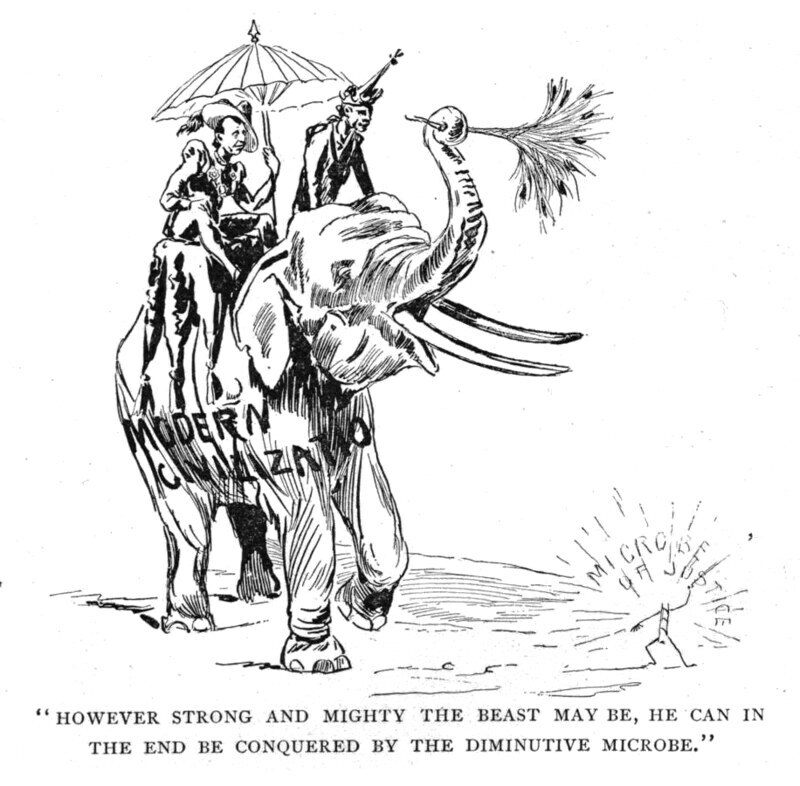 The experiments with Twain-style irreverence and with politcal illustrations established an interesting channel for Beard to transform Robert Baden-Powell’s chivalric brand of scouting into something more uniquely American. Especially as a member of the BSA’s founding committee, Beard was adamant that members must look inward, to the US, for inspiration and that scouts must not be modeled on narratives of “King Arthur, Richard the Lionhearted, Saladin of Saracens, or Robinhood.” He could easily summarize this list by saying: avoid all those sacred cows that lie within the satire of Twain. Moonblight and Six Feet of Romance (1892), by Daniel Carter Beard. 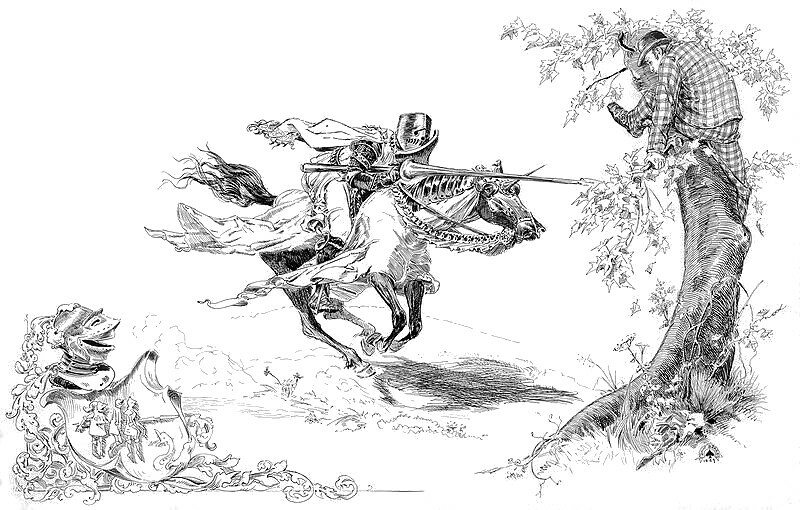 A Connecticut Yankee in King Arthur’s Court (1889), by Mark Twain, illustrated by Daniel Carter Beard. “Beard’s Celebrities at King Arthur’s Court”, from University of Virginia Library’s Twain site. Hardly a Man is Now Alive (1939) by Daniel Carter Beard. “A Connecticut Yankee in the Court of Wu Chih Tien: Mark Twain and Wong Chin Foo” (2010) by Hsuan L. Hsu. “The Unexpurgated A Connecticut Yankee: Mark Twain and His Illustrator, Daniel Carter Beard” (1976) by Beverly R. David .